Indole-3-carbinol (I3C) is found in cruciferous vegetables such as broccoli, cauliflower, and Brussels sprouts. I3C functions as an antioxidant, stimulates natural detoxification enzymes and promotes healthy metabolism of estrogen. It also supports the function of healthy breast and cervical cells and has shown to support prostate cell metabolism. The antioxidants found in green tea are more powerful than those found in other tea varieties because of how green tea is made. Green Tea Extract contains numerous compounds, including Polyphenols and Catechins that provide potent antioxidant benefits which help fight off free radicals that can damage our cells, causing them to age and even make us sick. EGCg is the most powerful of these catechins. It has been linked to numerous health benefits. Ongoing studies have seen positive results using EGCg for weight loss as a natural fat burner/metabolism booster, promoting cardiovascular health, protecting skin from ultraviolet rays and even to prevent breast cancer and other forms of cancer. 200mg EGCg posesses the phytonutrient content equal to about 2-3 cups of green tea. Water Ease is an excellent product to treat water retention and bloating as well as high blood pressure. Water Ease provides two key ingredients for healthy water balance, high blood pressure, a healthy heart, and provides antioxidant defense. Taurine is a natural diuretic as well as being amazing for the heart. This supplement also gives you an extra helping of vitamin B6 which is good to help naturally regulate water balance in the cells and relieve some Premenstrual Syndrome (PMS) symptoms. Most women experience bloating (excess water retention) during symptoms of PMS before and during their menstrual cycle. Water Ease can help reduce the amount of bloating you experience. This diuretic does not cause any loss or imbalance of minerals in the body. Make this a part of your morning routine! Feel bettter while boosting your energy!!! 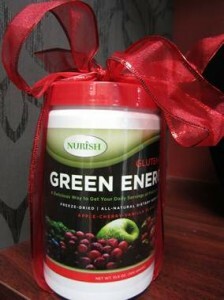 Green Energy is a blend of 40 natural and organic Super Foods that contains the antioxidant & phytonutrient power equal to 25 servings of fruits and vegetables. No Preservatives! No Artificial Sweeteners, Colors or Flavors! No Yeast, Eggs, MSG or GMO!